Now that we’ve wrapped up Orphée et Eurydice, it’s time to put the spotlight on our 2011/12 Young Artists! On March 31, they'll open their fully-staged production of Don Pasquale at University of Washington’s Meany Hall for the Performing Arts, with additional performances on April 1, 6, and 7. This is the first time our Young Artists Program production will be at Meany Hall, and we’re excited for this appearance in a new venue that will beautifully showcase this talented group of singers. 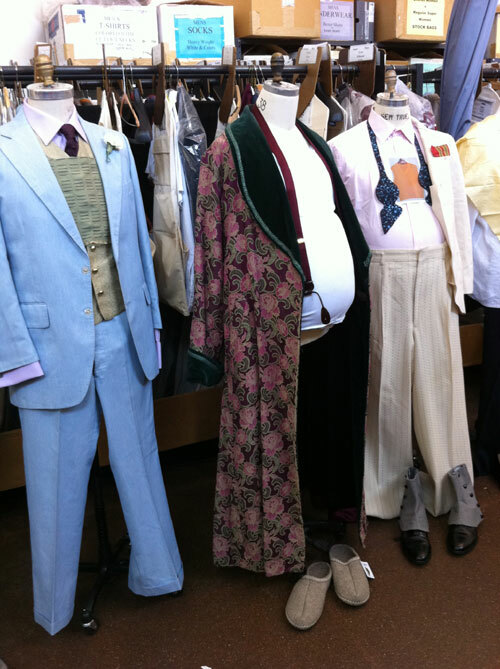 Costumes, in progress, for the Young Artists Program production of Don Pasquale. Starring in all performances as Don Pasquale is bass Michael Uloth, who will make his Seattle Opera mainstage debut in May as the Imperial Commissioner in Madama Butterfly. The March 31 and April 6 performances of Don Pasquale feature a trio of returning Young Artists: soprano Amanda Opuszysnki as Norina, tenor Andrew Stenson as Ernesto, and baritone David Krohn as Dr. Malatesta. Audiences will recognize these talented singers from Seattle Opera’s recent production of Carmen, in which they sang the roles of Frasquita, Remendado, and Dancaïre, respectively. Stenson had a recent triumph when he sang the demanding title role at the March 4, 2012, performance of Orphée et Eurydice, covering for an injured William Burden. On April 1 and 7, soprano Lindsay Russell sings Norina, tenor Jason Slayden is Ernesto, and baritone Joseph Lattanzi portrays Dr. Malatesta. Slayden recently made his mainstage debut as Uldino in Attila, and Lattanzi sang the role of Moralès in Carmen. Sets are designed by Donald Eastman, lights by Chris Reay, and costumes by Deborah Trout. This is the first time our Young Artists Program production will be at Meany Hall, Sam Tripoli and we’re excited for this appearance in a new venue that will beautifully showcase this talented group of singers.